Most people who work out have some insecurity they face every time they set foot in a gym. Some people are self-conscious about their weight or the type of exercise they’re capable of performing. Some people can’t find the motivation or the time to get to the gym. Others are worried about whether the muscle-man next to them is going to be too territorial with the weight equipment, making it impossible to complete a workout without fear of a confrontation. For others in our GLBT community, the thought of being vulnerable in a gym is too discomforting for a gym membership to be beneficial. 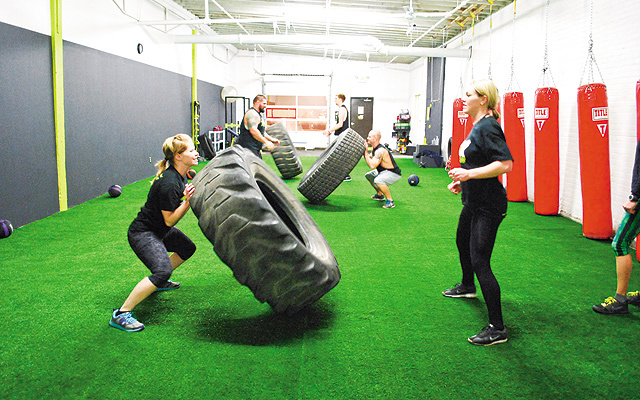 Whatever that hurdle is, there’s a new fitness studio that makes the comfort, safety, and morale of its clients a priority—AX Fitness in Northeast Minneapolis. A simple glance at the studio proves that this is not your average gym. Instead of a bunch of complicated machines, there are some punching bags and tractor tires. Chalkboards with personal goals and accomplishments cover the walls. And owner Christine Jaques’s belief that “fitness is personal” is felt the moment you’re welcomed at the door. With its unconventional space and personal touches, the AX Fitness studio is the gym for fitness junkies as well as people who hate going to conventional gyms. As a long-time athlete, Christine Jaques has always been an avid fitness guru. (Name any sport, and you can bet she’s either played it, coached it, or managed it!) But it wasn’t until later in her life that she discovered her potential to put her passion to work by helping others reach their goals through personal fitness training. Proudly dubbed “The Organic Gym” due to its intentional differences (such as fundamental training methods and a lack of traditional exercise machines) that set it apart from corporate gyms, AX Fitness is the preferred fitness program for numerous clients, including many of the Minnesota RollerGirls. 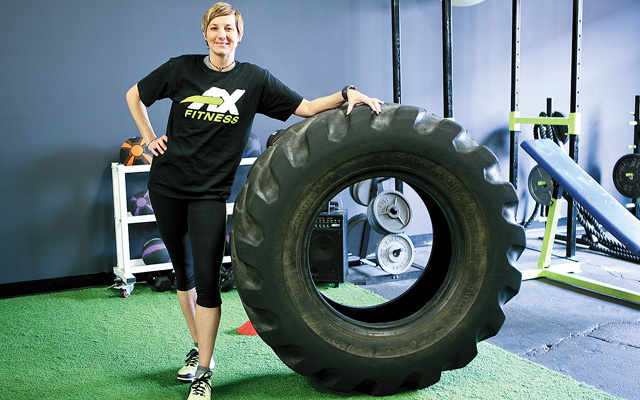 With her new studio in Northeast Minneapolis, Christine Jaques uses AX Fitness to inspire her clients to improve their health and well-being in an open and inclusive environment. After working several jobs in various fitness and recreational fields, Christine had had enough. She recalls, “I was sick of working temporary or seasonal recreation jobs. I said, ‘I’m going to be in control of my own destiny.’” Christine enrolled in a personal training program at MCTC and got certified in 2012. As part of her education, she held an internship at Acceleration Minnesota in Arden Hills, which focuses on sports training. She notes, “I went there on purpose because I wanted to go somewhere that was much more athletically inclined than a regular gym.” During her initial meeting, Christine inquired about Acceleration’s cardio kickboxing program, only to learn that the program wasn’t offered anymore. She took that opportunity to recreate a new version of cardio kickboxing including some additional elements to the workout. A new program was developed from the cardio kickboxing class—what is now called AX Fitness. Christine then found herself with quite a bit more responsibility than most interns; she was trusted to run the AX Fitness program out of the Acceleration location. As AX Fitness became more popular, Christine began to dream of her own studio. The only problem came with the cash—any business owner knows that startup money isn’t easy to come by. But Christine was able to lean on her AX Fitness community to help her dream come true. Many clients who believed in her program offered to donate or loan money to allow Christine to move into her own studio in Northeast Minneapolis. Christine recalls the generosity of one particular lender. One man was dragged to AX Fitness by his wife because she was sick of him using his back pain as an excuse to not work out. Christine discussed his limitations and created a fitness program to help him safely strengthen his back. Less than a year after he began his training, he finished his first marathon. Christine improved his quality of life so much that he became a lender for her new space. Like this man, most of Christine’s clients have had such positive experiences that they are willing to support the future of AX Fitness. The AX Fitness workout proves that you don’t need a lot of fancy equipment in order to get a good workout. Using mostly bodyweight exercises, core exercises, and some additional props (including medicine balls, hand weights, and tires of various weights), Christine creates workouts that are beneficial to both athletes and average people who want to make significant improvements in their fitness. She notes, “The workout encompasses every part of your body…even muscles that you don’t even think you have! We try to engage all those small muscle groups that people forget to work out because those groups help your larger muscle groups work harder. We always keep the cardio capacity up because it increases muscular endurance. If you’re an athlete, I want you at 100% your entire shift, and I want you at 100% as many times as possible throughout that game. The only way to do that is to train your body as a whole. My workout improves cardio capacity, muscular strength, and endurance, power, and speed.” The AX Fitness class allows participants of all levels to work at their own intensity and speed, ensuring that they feel challenged to push their limits in a safe, controlled environment. For more detailed pricing, class schedules, and more information can be found at www.axfitness.com. Good stuff. I’ll be there on Tuesday for a Cardio Box Nooner!